Mr. Vonzo Lester Turner, Sr. "V.L. ", 85 of Athens, AL passed away August 29, 2009 at his home in Athens, AL. Funeral service at Limestone Chapel Funeral Home with Mike Westmoreland and Donald Vickers officiating. Burial in the Limestone Memorial Gardens. Mr. Turner was born on March 17, 1924 to Henry Brown Turner and Minnie Etta Franklin Turner in Athens, AL. Mr. Turner worked for WSLV of Ardmore as a Gospel Disc Jockey. He was a member of Madison St. Baptist Church. He was preceded in death by his parents: Henry and Minnie Turner; a daughter: Barbara Bell; son: Timothy Turner, brother: Byron Turner. 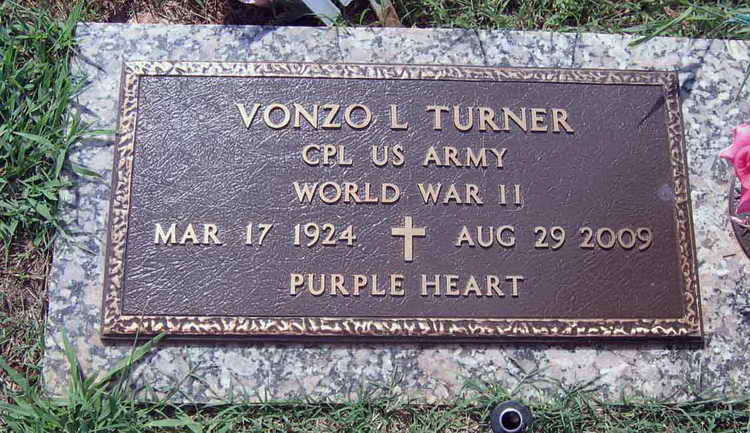 Grave marker for Vonzo L. Turner in the Limestone Memorial Gardens, Athens (Limestone county), Alabama. Vonzo enlisted in the Army at Ft Benning, GA and was assigned to Hq 3rd, 508th. Pvt Turner was slightly injured in action on 30 September in Holland. He was evacuated and did not return to he regiment. Pfc Turner did, however, re-enlist on 9 January 1946 and attained the rank of Cpl.